Home / Articles / Can I Return To The Marital Home After Leaving? Can I Return To The Marital Home After Leaving? My wife asked me to move out during a trial separation a couple months ago. We were planning on going to marriage counseling, but I just found out she filed for divorce. Can I move back into the house? We have three children together and I’m worried she is going to get custody since she is in our home and I’m not. While I am not licensed to practice law in your state and cannot give you legal advice, I can give some general observations on this issue based on the jurisdiction where I practice. Where I practice in Pennsylvania, there are usually two methods by which a spouse can be required to leave the marital residence. With a divorce case open and while the final disposition of the marital residence is pending, a party may, upon filing of the proper petition, ask the court to assign exclusive control and possession of the marital residence to him or her. See 23 Pa.C.S.A. § 3502(c). In making a determination on exclusive possession, the court usually considers, for example, the ability of the party leaving to find proper housing and who has custody of the children. Another example is through an eviction and exclusion order by the court for an action under the Protection from Abuse Act. If the court finds that a spouse has committed domestic violence, per the Act, then it can order as a form of relief that the defendant is to leave the residence where the plaintiff resides. See 23 Pa.C.S.A. § 6108(a)(2). Obviously, a protection from abuse action is a very serious matter, and generally tends to be the less frequent manner in which a spouse leaves the marital residence. Due to the extremely fact-specific nature of this situation, I would strongly suggest you contact an attorney who handles family law matters in your jurisdiction, such as Cordell & Cordell, to see how your state’s laws can specifically help you with this serious situation. This type of attorney should be helpful in providing you specific assistance for your matter. Remember, I am unable to provide you with anything more than divorce tips, so please consult a domestic litigation attorney in your jurisdiction to obtain specific advice as to the laws in your state and how they particularly impact your potential case. 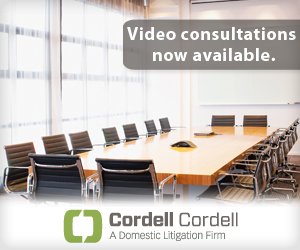 To arrange an initial consultation to discuss divorce rights for men with a Cordell & Cordell attorney, including Pennsylvania divorce lawyer William J. Phelan, IV, contact Cordell & Cordell. ← Can I Use Cancelled Checks As Proof Of Child Support Payment?